All transactions are safe and secure with a reliable history in online purchasing behind each of our associates. 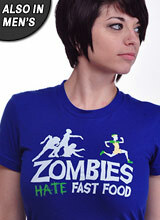 Buy the Zombies Hate Fast Food t-shirt to own Zombieland clothing and merchandise. In case you don't have your weapon of choice at hand like a toilet tank lid, grand piano, hedge clippers or cotton balls, this tee will remind you that zombies hate fast food. This Zombieland shirt features a potential victim sprinting away from a pack of zombies. He looks to have limbered up and is dressed in running attire. This zombie tee emphasizes the importance of Survival Rule #1, Cardio. Remember the Double Tap and the other zombie rules. They could prove useful in saving your life. In addition to the Zombies Hate Fast Food tee above, browse the Zombieland Clothing Gallery for more apparel like men's and women's clothes, kids shirts or hoodies.